Report on the 2nd Annual Taste of Anderson Valley, held on Thursday, November 9th, 2017, at the Golden Gate Club in the Presidio of San Francisco, California. The event was presented by the Anderson Valley Winegrowers Association and Taste West Wine Events, with sponsorship from Visit Mendocino County, and it featured an extensive tasting of wines sourced from vineyards in Anderson Valley. The event included an afternoon trade and media tasting followed by an evening tasting for consumers. It also featured a silent auction, with 50% of the proceeds going to benefit fire relief efforts in Mendocino, Sonoma, and Napa Counties. I attended the trade and media tasting, and the tasting impressions below are from that portion of the event. The Anderson Valley Winegrowers Association (AVWA) is a not-for-profit trade group created in 1983 to promote the grapes and wines of the Anderson Valley winegrowing appellation. 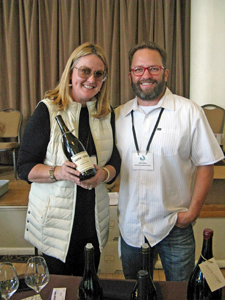 The organization holds several annual wine events in Anderson Valley along with this event, which showcases the region’s wines in the heart of the San Francisco Bay Area. Along with promoting the Anderson Valley as a viticultural region, the AVWA also works to help the community, and it has raised over $325,000 that has been donated to local community groups. 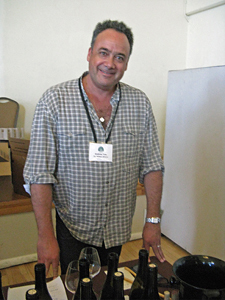 AVWA executive director John Cesano was on hand at the Taste of Anderson Valley event. I was not able to attend the first Taste of Anderson Valley event last year, so I was glad that I could make it there this year. 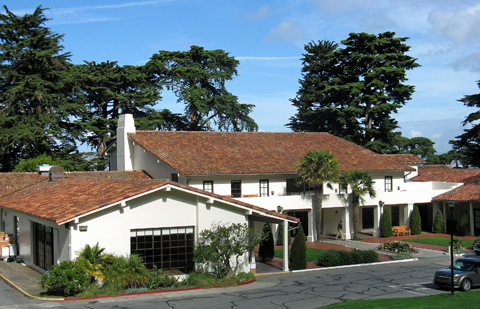 The Golden Gate Club was a perfect venue – the room was just the right size for the number of participating wineries without it feeling too crowded, and the view of San Francisco Bay from the space may be the best of any wine event venue in the Bay Area. As noted above, there was a silent auction as part of the event, with 38 auction lots featuring many hand-signed and large-format bottles. It was also possible for consumers to purchase wines directly from participating wineries at the event. There was some delicious-looking food available for tasters, though I focused on the wine given the limited time available for tasting. A total of 35 producers (including one cider producer) poured at this year’s Taste of Anderson Valley, though not all of them were there for the trade and media tasting. I managed to taste at 17 winery tables during the 2½-hour afternoon tasting. I had visited Anderson Valley in early August and tasted with a number of the producers at that time, so I limited my tasting at Baxter, Drew, Foursight, and Navarro, and skipped Pennyroyal Farm – all very good producers, but I’d already tasted most or all of the wines they were pouring at the event. I also decided to skip sparkling wines at this tasting. There were several other producers I’d hoped to check out but I ran out of time to get to all of them. A little background on Anderson Valley is in order here – although it's only about a 2½-hour drive from much of the Bay Area, the valley feels farther away, since there's no way to get there except along fairly slow, winding roads. Highway 128 runs through the valley, which is oriented roughly east to west. Boonville is near the eastern end of the valley, the smaller town of Philo is near the middle, and the even smaller village of Navarro is at the western edge – the “Deep End” of the valley. The ocean is only a few miles farther west, so fog and sea breezes keep the valley cool even when nearby areas can be scorching hot in the summer. Forests and grassland cover the hillsides to the north and south of the valley floor, where vineyards share the landscape with woodlands, orchards, and pasture. Italian and Swiss immigrants planted wine grapes in the area in the late 1800s, but the wine industry virtually died out during Prohibition, although several old Zinfandel vineyards high on the ridges between the valley and the ocean survived and continue to produce today. The modern era of Anderson Valley wine only began in the mid-1960s when Dr. Donald Edmeades planted 24 acres of vines, and the region started to grow in earnest during the 1970s, when wineries such as Husch, Navarro, Lazy Creek, and Greenwood Ridge started up. The Anderson Valley AVA was recognized in 1983. Today, most of the planted winegrape acreage is Pinot Noir, Chardonnay, Gewürztraminer and Riesling, along with Sauvignon Blanc, Pinot Gris, Merlot, and a few other varieties. The region is well-known for its sparkling wines as well as its still wines. With limited time available to taste at the event, I stuck almost entirely to producers I was already familiar with, so I was not surprised to find so many noteworthy wines. I was also not too surprised that all of the reds I tried at the tasting were Pinot Noir, the variety that Anderson Valley is best-known for. There were fewer white wines and only a single rosé at the tables I visited. The Pinots I tasted were mostly from the 2014 and 2015 vintages, and where a winery poured wines from both vintages, I tended to prefer the 2015 Pinots though that was not always the case. Favorite wine line-ups that I tried at the Taste of Anderson Valley included those from Black Kite, Copain, Littorai, Smith Story, and Waits-Mast, while others such as Angel Camp, Balo, Handley, Husch, and Navarro were not far behind. Add in the fine producers I’d visited a few months earlier and it’s easy to see that every winery table I tasted at during this event was worth checking out, and all of them featured at least one noteworthy wine. Because of its relatively remote location, Anderson Valley is sometimes overlooked among California’s top wine regions, but this tasting demonstrated that wines sourced from the area’s vineyards can be top-notch. While it’s well worth visiting Anderson Valley – something I need to do more often myself – the opportunity to taste so many fine wines from there right in San Francisco is something that’s hard to pass up, and I’ll try to make this event a regular from now on. Be sure to put the Taste of Anderson Valley event on your calendar for next year. Angel Camp Vineyard, in the Deep End of the valley, was planted in 2006, while 2011 marked the first vintage for the Angel Camp label. Brian Zalaznick and his wife Cindy Storman are the proprietors, and they’ve assembled a fine team to work with – Paul Ardzrooni is their vineyard manager while Phillip Baxter is the consulting winemaker. 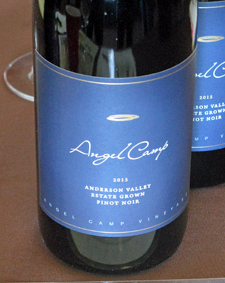 Angel Camp is a specialist in estate-grown Pinot Noir, and they had their two most recent vintages available to taste at the event. The 2015 Estate Pinot Noir was my favorite of the two, with earthy cherry, tea leaf, and spice aromas and vibrant acidity – still a youngster with plenty of potential for development. I also liked the 2014 Estate Pinot Noir – more earth and spice notes along with raspberry aromas and bigger structure. Balo was founded in 2009 by growers Tim and Michele Mullins. The estate Balo Vineyard is in the Philo area and was first planted in 1998. It’s farmed organically, though not yet certified. 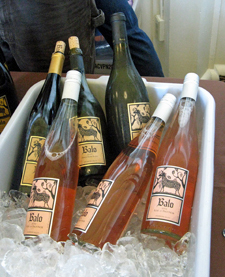 All of the Balo wines are made from estate fruit. Jason Drew made the wines until mid-2016, when current winemaker Alex Crangle – who’s been at Balo since early 2012 – took over. Alex was behind the table at the tasting and poured some fine wines. I liked the 2016 Rosé of Pinot Noir, which spent about four hours on the skins – this was light and lively, with watermelon, strawberry, and spice notes and a bright mouthfeel and finish. The darker-fruited, earthy, and mushroomy 2014 Estate Pinot Noir was nice, but I especially enjoyed the 2015 Estate Pinot Noir, which featured brighter red fruit along with tea leaf, flowers, and forest floor notes. The Baxter label was founded in 2002 by Phil Baxter and his son Phillip. Both studied winemaking (at Cal State Fresno and UC Davis, respectively), and have long backgrounds in the wine business. The first vintage of Baxter wines was from 2003. Phillip has headed up the winemaking for the label since its inception, though both father and son play integral parts in the process. Phillip was on hand for the tasting, and since I had visited the Baxter tasting room in Philo recently I tasted only one wine at this event – the 2014 “Black Label” Pinot Noir. The fruit was sourced from several Anderson Valley vineyards and was a standout, with bright red fruits, spice, hints of flowers, and a saline quality, with fine acidity on the palate – a different and intriguing Pinot. Rebecca and Tom Birdsall are the proprietors of Black Kite. Rebecca’s parents planted their 12-acre estate Kite’s Rest vineyard to Pinot Noir in 1999 in the Deep End of Anderson Valley, and the winery’s first vintage came in 2003. 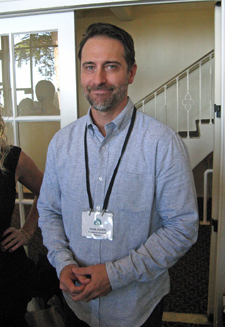 Jeff Gaffner has been the consulting winemaker since 2005. Co-proprietor Michael Green, the nephew of Rebecca Birdsall, poured the wines at the event. The 2014 “Kite’s Rest” Estate Pinot Noir comes from three clones sourced from all three of the Anderson Valley estate vineyard blocks. Bright and structured for mid-term aging, with red fruit, spice, and dried herb aromas. All three of the single vineyard block Pinots were good. The spicy and structured 2014 “Redwood’s Edge” Estate Pinot Noir was notable but my clear favorite of the three was the 2014 “Stony Terrace” Estate Pinot Noir – this had a darker fruit profile with more earth and forest floor notes, plus a stony mineral note and fine structure. Established in 2007, Bravium is the project of owner/winemaker Derek Rohlffs, who was behind the winery table at the tasting. The current Bravium releases include a Russian River Valley Chardonnay in addition to the Pinot that Derek poured. (Disclosure – I’ve helped out with bottling for Bravium) The 2015 Anderson Valley Pinot Noir was sourced mainly from Wiley Vineyard in the Deep End of Anderson Valley along with fruit from Valley Foothills and Donnelly Creek vineyards. Showing lots of spice along with red fruits, flowers, and earth, the wine had a lively texture with moderate tannins – this should develop nicely over the next few years. Wells Guthrie established Copain in 1999, and over the years many of the winery’s best-known wines have been sourced from Anderson Valley vineyard sites. The Copain label was purchased by Jackson Family Wines in 2016, and Wells has remained as winemaker. Copain poured four wines at the tasting – all were good, and I thought three of them were particularly noteworthy. The 2015 DuPratt Vineyard Chardonnay was sourced from 40+ year-old organically-farmed vines, and displayed citrus and pear fruit, spice, and flowers on the nose, with a chalky mineral texture and finish. The earthy raspberry and herb scents of the lively 2015 “Les Voisins” Pinot Noir were quite pleasant, but the standout wine – and my favorite Pinot of the entire tasting – was the 2014 Kiser Vineyard “En Haut” Pinot Noir. This featured flowers, exotic spices, black cherry, and earth aromas with fine structure and a stony mineral note on the finish – already a stunning wine but deserving of time in the cellar to develop further. 2012 was the inaugural vintage for Domaine Anderson. Established by the Rouzaud family (Jean Claude Rouzaud is Chairman of Louis Roederer), Domaine Anderson acquired 50 acres of vineyards near Philo in 2011. 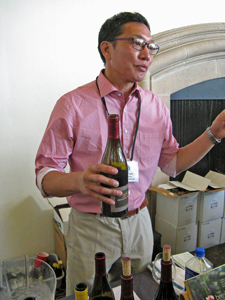 Winemaker Darrin Low was on hand to pour the wines, and my favorite of the ones I tasted was the 2015 Estate Chardonnay. This showed citrus and earth aromas with a medium-light texture and great acidity. Also nice was the 2013 Dach Vineyard Pinot Noir, from the winery’s biodynamically-farmed estate vineyard – black cherry and plum fruit with a mushroomy forest floor element and undertones of sweet oak. Jason and Molly Drew moved both their wine focus and their family from Santa Barbara to Mendocino in 2005 – they’re located only about three miles from the ocean in the Mendocino Ridge AVA. They planted their own estate vineyard with eight clones of Pinot Noir in 2011, with the first harvest from there coming in 2014. Molly was behind the table at the tasting, and since I’d visited the vineyard and winery a few months earlier, I decided to taste only two of their wines this time. The 2015 “The Fog-Eater” Pinot Noir was sourced from Valenti, Balo, Fashauer, Perli, and Joshua’s vineyards. Bright and savory, with mushroom, spice, and black cherry aromas, this had a chalky mineral note on the finish. The 2015 Balo Vineyard Pinot Noir was more herbal and a bit peppery, with a bigger structure that suggests laying it down for a few years may be a good choice. Kristy Charles was on hand to pour her family’s wines, all of which are sourced from their 15-acre estate vineyard just outside of Boonville. The Charles family first settled in Anderson Valley in 1943. The vineyard was planted in 2001, and Kristy and her husband Joe Webb founded Foursight in 2006 along with Kristy’s parents Bill and Nancy Charles. Joe has been the winemaker since the label’s inception. I had visited Kristy and Joe in early August, so I only tasted two wines at the event. My favorite was the 2014 “Zero New Oak” Pinot Noir – this featured bright red fruit, herbs, and flowers on the nose, with an intriguing chalky mineral texture on the finish. Also good was the 2015 “Clone 05” Pinot Noir, a bit bigger and spicier, with touches of black pepper, earth, and sweet oak. Founded in 1982 by Milla Handley, the estate vineyard near the small town of Navarro in the Deep End of Anderson Valley has been certified organic since 2005. A second estate vineyard is 7-acre RSM Vineyard, planted from 1999-2001. Milla announced her retirement in June 2017 – her daughters, Lulu McClellan and Megan Handley Warren, are taking over management of the winery. Randy Schock, who’s been with the winery since 2004, has become the lead winemaker, and he poured the Handley wines at the tasting. The tropical fruit, citrus, and herb notes and lively mouthfeel of the 2016 Pinot Gris were quite appealing. Sourced from three sites, the recently-released 2015 Anderson Valley Pinot Noir was lighter-bodied, with lots of tea leaf and mildly floral aromas along with cherry fruit. My favorite of the Handley Pinots was the 2014 Estate Pinot Noir, with its classic Anderson Valley mushroom / forest floor character along with black cherry and plum fruit plus hints of flowers and spice. 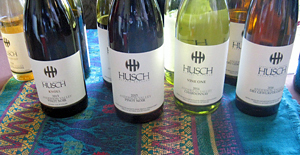 Located between Philo and Navarro, Husch is the oldest winery in Anderson Valley – it was established by Tony and Gretchen Husch in 1971. The winery has been owned by the Oswald family since 1979. The current proprietors, Zac Robinson and Amanda Robinson Holstine, are the third generation of the Oswald family at Husch, and Brad Holstine and Jeff Jindra head up the winemaking team. Jeff was behind the winery table at the event, and I enjoyed the wines, several of which I thought were standouts. The 2016 Anderson Valley Dry Gewürztraminer displayed upfront lychee, citrus, and spice aromas with a lively texture and clean finish. Lighter-bodied, spicy, earthy, and red-fruited, the 2015 Anderson Valley Pinot Noir showed off the character of the region well, while the 2013 “Knoll” Pinot Noir was a step up. This vineyard site includes vines from Anderson Valley’s first planting of Pinot Noir in the early 1970s, and the wine featured a somewhat darker fruit profile along with more tea leaf and earthy forest floor notes, plus a more structured mouthfeel and finish. 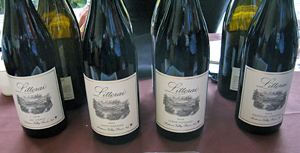 Littorai Wines was established by Ted and Heidi Lemon in 1993. The Lemons purchased property in 2003 between Sebastopol and Freestone and completed a gravity-flow winery built with straw-bale construction there in 2008. All of the Littorai vineyards are farmed organically or biodynamically – the estate Pivot Vineyard at the winery property is part of an overall biodynamic farm there. Littorai has been working with Anderson Valley fruit for many years, and there were several standouts among the wines poured at the event. The 2016 “Les Larmes” Pinot Noir is an Anderson Valley appellation blend, and this showed characteristic tea leaf, earth, cherry, and spice on the nose, with a lively mouthfeel. The 2015 Cerise Vineyard Pinot Noir had darker fruit and spice with a stony mineral element and a more structured texture. Best of all was the 2015 Savoy Vineyard Pinot Noir. This displayed a savory character, with tea leaf, earth, and mushroom aromas plus black cherry and flowers, with bright acidity and fine tannins – one of my favorite Pinots at the event. One of the earlier modern Anderson Valley wineries, Navarro was established by Ted Bennett and Deborah Cahn. In 1974, they began planting their estate vineyard near Philo with Gewürztraminer, Pinot Noir, Riesling, Muscat, and Chardonnay. They’ve become one of Anderson Valley’s best-known wineries, and winemaker Jim Klein has been at Navarro since 1992. Navarro produces a wide variety of wines – currently around 30 different bottlings. I had visited the Navarro tasting room in August so I only tasted three wines at the event, but they were all good. The 2015 Pinot Gris featured bright citrus fruit along with an herbal component, and great acidity on the palate and the finish. The 2013 “Méthode à l'Ancienne” Pinot Noir was savory, with red fruit, earth, and lightly floral touches, with great structure. I finished my tasting at the event with the 2016 Late Harvest Riesling – apricot, honey, spice, and a touch of Riesling petrol on the nose, with a rich, sweet finish. Eric Story and Alison Smith-Story are the husband-and-wife proprietors of Smith Story Wine Cellars. This is a newer winery, launched in 2013. The two met while they were both working for K&L Wine Merchants, and their experience in the wine business has been helpful in getting their label off the ground. The well-regarded team of Ross Cobb and Katy Wilson are the Smith Story winemakers. Eric and Alison were both at the tasting and poured their two Anderson Valley Pinot Noirs, both of which were very good. The 2015 Helluva Vineyard Pinot Noir comes from a site in the Boonville area – this was bright and savory, with red fruits and spice plus a touch of sweet oak. The 2015 Nash Mill Vineyard Pinot Noir comes from the Deep End of Anderson Valley, and this showed a more minerally character, with black cherry fruit, tea leaf, and hints of flowers and earth, with a bit more structure on the palate and the finish. The Withers Winery is the project of proprietor Andrew Tow and his wife Kathleen. The Withers focuses on Pinot Noir and Rhône-style wines, which are made in Sonoma County by David Low (of Anthill Farms). Fruit for The Withers’ Rhône wines comes from El Dorado County while Chardonnay and Pinot Noir is sourced from Anderson Valley and the Sonoma Coast. Andrew poured his wines at the event. The 2014 Charles Vineyard Pinot Noir displayed herbal and stony mineral elements plus floral and black cherry notes, with fine acidity and structure. Andrew also poured two Pinots from the Sonoma Coast, both of which were very nice, my favorite being the savory, spice, and structured 2015 English Hill Vineyard Pinot Noir. Jennifer Waits & Brian Mast established their winery in 2005, and they focus on Pinot Noir sourced from Anderson Valley, Mendocino Ridge, and Comptche. 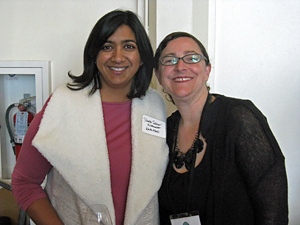 The wines are made in San Francisco, and Shalini Sekhar is the consulting winemaker. (Disclosure – I’ve helped out with bottling for Waits-Mast) Jennifer and Shalini were behind the winery table, and Brian arrived just as I was finishing up my tasting there. The three wines I tried were all very good, with two I particularly liked. The 2015 Nash Mill Vineyard Pinot Noir had upfront floral and spice aromas along with bright plummy fruit, earth, and medium body with a stony mineral note on the finish. Another standout was the 2013 Deer Meadows Vineyard Pinot Noir – this featured more earth and tea leaf character along with cherry and spice aromas, with a bigger structure and fine tannins. One of California’s most storied Pinot Noir producers, Williams Selyem was founded by Burt Williams and Ed Selyem, with their first commercial vintage coming in 1981. 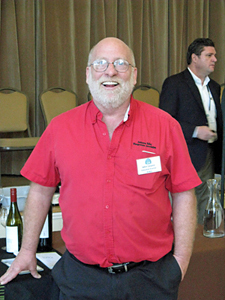 John Dyson purchased the winery in 1998, and a new winery facility was completed along Westside Road in Russian River Valley in 2010. Bob Cabral made the wines for a number of years following Burt and Ed’s departure, and Jeff Mangahas took over as head winemaker in 2015. 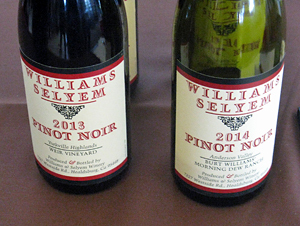 Williams Selyem has made a Pinot Noir from Ferrington Vineyard near Boonville for many years. At this event, they poured a earthy, spicy, and structured 2013 Weir Vineyard Pinot Noir from Yorkville Highlands. From Anderson Valley itself, the 2014 Burt Williams Morning Dew Ranch Vineyard Pinot Noir was notable. The vineyard was planted in 2000 by winery founder Burt Williams, and this wine displayed black cherry and raspberry fruit, spice, earth, tea leaf, and vanilla/oak, with lively acidity and good structure.